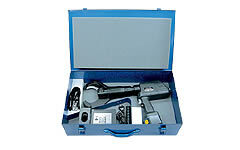 REC-485YC Battery Operated Tools: Izumi Products. 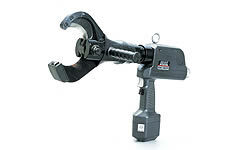 The REC-485YC scissors type cutter was designed to cut various cables used in industry today. It is equipped with rapid ram advance mechanism for faster operation. With a pull of the trigger, you can cut Cu and Al cables up to 85mm and CCP cables up to 85 mm. The scissor type cutter head provides exceptional ease of use and maneuverability when making many cuts. The REC-485YC has an overload bypass which will kick out when the tool reaches 8.1 tons of output. Lead sheathed cable (85mm OD) : 30 cuts.